We've heard them called embedded case managers, nurse navigators, care coordinators and even wilderness guides in the Northwest section of the United States, and they’re showing up in primary care practices, hospital emergency rooms, and even long-term care facilities. 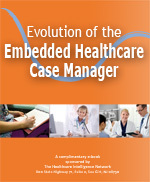 We’ve watched with interest the emerging trend of the colocated healthcare case manager and created a free e-book that presents the latest industry benchmarks on this population health management strategy as well as a look at how Geisinger Health System, Bon Secours Health System and others are colocating case managers at points of care. These organizations are reporting reductions in hospital readmissions, length of stay and patient cycle times, among other benefits. Click here to download this free e-book today.